Making Painting explores the timeless act of painting through the work of two artists separated by one hundred years and nearly four thousand miles: JMW Turner (1775-1851) and Helen Frankenthaler (1928-2011). Turner, celebrated as a great nineteenth-century painter of landscape, transformed the way we see and interpret our natural surroundings. In her canvases of the late 1950s onwards, American artist Helen Frankenthaler translated landscape into abstract compositions characterised by flooding colour and increasingly large scale. The exhibition explores the fellowship that the two artists – a Romantic nineteenth-century Briton and an Abstract Expressionist twentieth-century American – share in paint across their temporal divide. It includes a significant group of paintings by Frankenthaler from the 1950s to the 1990s alongside oil paintings and watercolours by Turner from throughout his career, with key works from the National Gallery and the Yale Centre for British Art collections. 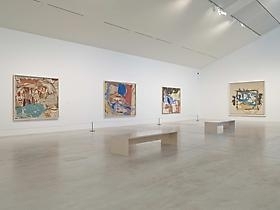 This is the first opportunity to see an exhibition of Helen Frankenthaler in a UK public gallery for over 30 years. Making Painting is curated by Turner scholar James Hamilton, whose writings on nineteenth and twentieth century art have explored the continuing resonance of Turner's life and work across the past two hundred years. A catalogue is available to purchase from Turner Contemporary. "Such dissolving forms and delight in paint itself are matched in Turner’s works, which progress from early bucolic scenes to skies of riotous swirling." "Naturally, leaves you hungry for more." "...traverses sea, space and time." "It is just that sense of poetic alchemy that brings these artists together and makes this exhibition sing."